I'm a big fan of Spanish wine and especially Tempranillo. 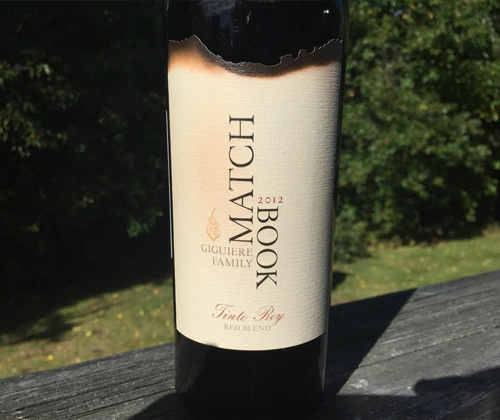 The founders of Matchbook Wine Company are big fans as well, and they've been growing Tempranillo in California's Dunnigan Hills since the 1980's. They also have a love of doing things a bit unorthodox and planting other grapes you don't normally see in Cali. For example: Graciano is a softer Spanish variety used in Rioja, and Tannat is a highly tannic French variety that's enjoying success in Uruguay. With their Tinto Rey ("Red King") blend they use 50% Tempranillo, 27% Syrah, 11% Petit Verdot, 8% Graciano and 4% Tannat. It's aged for 26 months in a combo of French, American and Hungarian oak. 22% of the wine is barrel aged in new oak barrels while 78% is aged in used oak barrels. I get aromas of cherries, blueberries, sand and leather. There's flavors of cherries, plums, oak and chocolate. It finishes with plums and spicy heat. It's medium-bodied and gets nice acidity and a touch of tartness from the Tempranillo, a round mouthfeel and fruit from the Syrah, and tannin from the Petit Verdot and Tannat. It's very well structured and offers everything to make it an excellent food wine and great just by itself. Pair it with pot roast, spicy ribs, or veggie pizza. BUUUUUUT... it's actually less expensive at Luke's of Cape Cod. So get it there if you can.